Paisley Pirates have been boosted by the formation of a Supporters Club which has already begun to provide vital lifeblood to the ice hockey team by way of a cash donation. The Supporters Club was formed in the summer after Pirates’ secretary Jackie Turley had spoken with a few enthusiasts about setting up a fans’ association, aimed at taking some of the many duties associated with running one of Scotland’s most successful amateur ice hockey clubs away from the main management group. 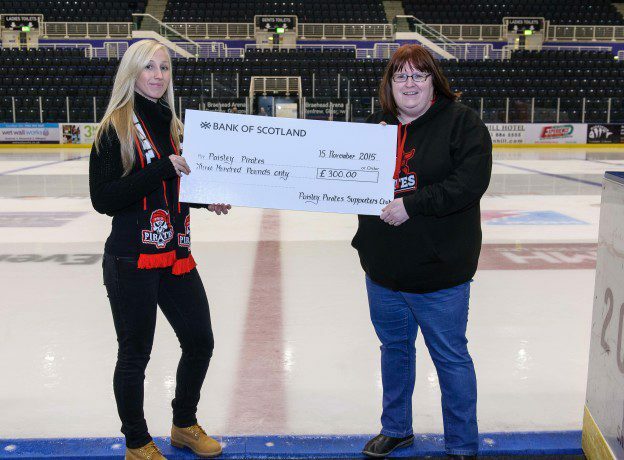 The Paisley Pirates Supporters Club (PPSC) was thus formed and has already set about the task of providing a focus for local ice hockey fans, while raising much needed cash for the team in the process. Pirates’ Treasurer Stacey Kerr receiving a cheque for £300 from the Secretary of the Supporters Club, Marie Cadenhead, Photo by Al Goold.